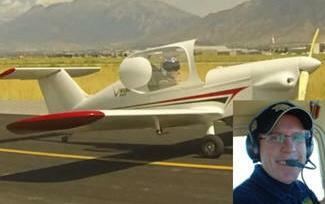 September 7, 2013 - On Friday, Jay Lessley, age 40, of Mapleton, Utah had departed from Spanish Fork Springville Airport, Utah just after 7:30 AM in an experimental aircraft the Skycraft SD-1TD (tail dragger) (N123SD). Lessley had taken the aircraft up for its owner, Tyler Ives of Skycraft, an aircraft kit builder out of Orem, Utah for a flight test in preparation for FAA aircraft certification. Within moments of the flight, Lessley lost control of the single engine kit built aircraft. The aircraft nose dived and then cashed into a field northwest of the Spanish Fork Springville Airport, Lessley was killed upon impact. Company officials were at the airport to gather test data from the flight. Witnesses reported that while performing a flight test on the aircraft, Lessley pushed the limits of the aircraft's capabilities when he performed a barrel roll, a maneuver the aircraft was not designed to handle. A barrel roll is a roll of the aircraft 350 degrees while maintaining a straight and level flight (imagine an airplane trying to fly in a horizontal corkscrew around the line of the direction of travel). Lessley had completed one barrel roll and then he attempted a second one when the aircraft began to spend out of control. The aircraft’s onboard ballistic parachute system, the Galaxy GRS which has a minimum deployment altitude of 500 feet was released however, it did not fully deploy. At 8:09 AM dispatchers with the Utah Valley Dispatch Special Service District received a call that a plane crashed near the Spanish Fork Airport. Responders searched for over a half hour at which point a farmer found the wreckage of the plane in his field. The crash site was a little over a mile north west of the Spanish Fork Airport. When deputies arrived they found that Lessley, who was the sole occupant of the plane, had apparently been killed on impact. Lessley was a flight instructor at Diamond Flight Center at the airport since March of 2009. He was also a police officer with the Utah County Sheriff's Office since 2004 and was promoted to Sergeant in 2011. He had flown with the Aero Bureau of the Sheriff's Office for several years. Lessley was regularly involved with Search and Rescue operations as a pilot and with prisoner extraditions. The owner of the company, Tyler Ives, told The Associated Press "The first roll went well, but the second roll was faster, and at that point the pilot appeared to lose control of the airplane. We were all puzzled. Rolls are not something it was designed to do, and he was pushing the airplane faster than it should go. Not to take away from the fact that Jay was an excellent pilot. He knew the limitations of the airplane, but he may have felt comfortable enough with the airplane that he did it anyway." About the SD-1 Minisport Aircraft - The Czech Republic designed SD-1 Minisport Tailwheel or Tri-gear configurations when certified will have a sticker price of $54,850 with the option to purchase the ballistic parachute for $4,150 and for mode S transponder at $3,150. The aircraft fuel consumption will be at 60 MPG at a cruise speed of 120 mph. The aircraft is powered by a by a 50 horse power German engine, Hirth F-23. The Hirth F-23 has a 1,000 TBO, making its operational engine overhaul costs just $4 an hour. This, combined with the 1.8 GPH fuel burn of the engine, makes the airplane’s total hourly operational cost just $12 an hour. The aircraft has a tri-blade propeller built by Sandera, a Czech company. It is composed of carbon fiber and has a ground adjustable pitch.